An adapter has been confirmed by Microsoft so you can use the 360 headset on the Xbox One. Albert Penello made this clear to the public over Twitter. They say that the adapter would be sold separately from the Xbox One.This will be added to the "Accessory" category. They made this Adapter because on the new Xbox One controllers the jack will be expanded. Since they said that Xbox One headsets aren't going to be included with the purchase of the normal Xbox One people may just get the adapter. But this is where the cost comes in, the comparison of the Xbox One Headset and the Adapter. 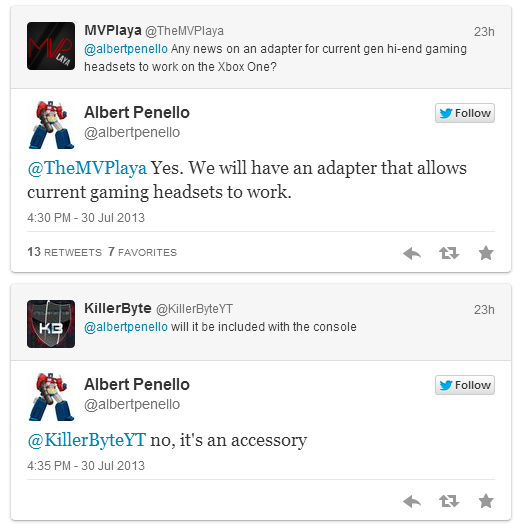 Microsoft may release more info about the adapter if they do I will be sure to update this.